This is a vehicle that struggled to find its footing within the automotive market. It launched in 2002 and was ultimately replaced by the superior B-Max in 2012. But don't rule this car out just yet! 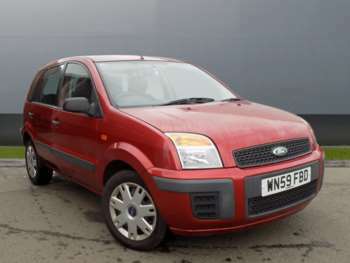 It makes a great used car purchase due to its affordability, handling and urban prowess. If you're in need of a runaround for city living, this is an excellent cost-effective choice. It's increased height and ruggedness make for a great city car, as it easily copes with common urban problems, such as speed bumps or tight corners. Seating room is generous, with plenty of space for luggage. Unlike other Ford offerings, the trim levels were marketed as 1, 2, 3, and +. The basic model features a cassette player, central locking and dual airbags, while the + has alloys, front fog lights, an alarm and a DVD player in the back. A redesign was released in 2005, featuring improved cosmetic changes and better electronics, such as an MP3 player. This car handles as well as the Fiesta or Focus from the same time period. Efficiency is impressive for both petrol and diesel variants, while the TDCi model is great when overtaking slower vehicles. If you're thinking of purchasing a Fiesta, you may want to take a look at a used Ford Fusion too. You might save more and be happier with the resulting purchase.